The LED models; M-10 Micro, M-40 and M-60 Minis are approved as Category 1 equipment for use in Zones 0, 1 and 2, and M-20 Xenon Mini is approved as Category 2 equipment for use in Zones 1 and 2. The M-10 Micro has a single white 5mm ‘Nichia’ LED light source and is powered by four alkaline LR44 ‘button cells’, giving an impressive beam with a two hour duration from a very compact size. The M-20 Mini uses a Xenon filament bulb powered by two LR03 ‘AAA’ cells, giving an excellent narrow beam of light with good range and up to 2.3 hours duration. The M-40 Mini has a cluster of three white 5mm ‘Nichia’ LEDs, and the M-60 Mini uses a single high power Cree LED giving remarkable light output; both products are powered by three alkaline LR1 ‘N’ cells giving up to ten hours of usable light with the M-40 and up to 3.5 hours* of usable light with the M-60. All supplied with cells. The Micro and Mini Torches have an ergonomic design and are constructed from high quality thermoplastic resin, with excellent impact and chemical resistance and the polycarbonate lens is set-back within the lens ring to minimise risk of damage. All models have a lanyard hole (M-10 Micro supplied with neck cord), an integral pocket clip for secure retention and to prevent roll on a flat surface, and a push-button for single-handed switching, which is shrouded to guard against accidental operation. All models are certified IP67, sealed against water/dust ingress. 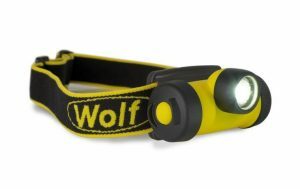 With a smooth, easy grip, ergonomic enclosure and a high output LED light source, giving up to 210 lumens of light output and bespoke optics delivering a narrow high intensity beam and, at the same time, a lower output wide angle fringe light, the Midi Torch is ideal for inspection and maintenance work in conditions of darkness or reduced visibility. The single-handed push button switch with rubberised switch cover and raised surface enable easy switching, even with gloved hands, and shrouded to avoid inadvertent operation. The strong, durable torch body enclosure has excellent chemical resistant properties and a proven impact resistance, even at sub zero temperatures. The rubber armoured lens ring gives enhanced grip and shock protection with a shatterproof polycarbonate lens providing excellent resistance to impact damage. It is sealed dust tight and protected from water immersion with an IP67 rated enclosure. The straight body configuration has an anti-roll foot allowing it to be placed securely on its base or side. The Midi Torch has a battery duration of up to 7 hours, after which it is recommended that the user replaces the batteries to avoid the risk of battery leakage, the high power LED light source is ‘fitted for life’. The torch’s internal construction is a one-piece assembly with LED, circuit, switch and battery cassette for easy replacement of the 4 AA alkaline primary cells. Details of the specific approved AA cells for use in T4 gas atmospheres can be found in the instruction manual; all other AA alkaline primary cell types allowable for use in maximum T3 rated Zone 0 areas. 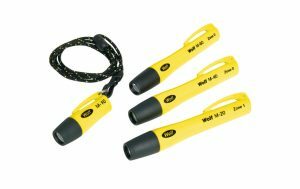 The ATEX Safety Torch is a reliable, simple and cost effective portable light and is available with a straight or right-angle body style and vacuum or xenon bulbs and is CE marked to the ATEX directive and IECEx certified for safe use in Zones 1 and 2 potentially explosive gas, vapour and mist atmosphere, where a T6 or T4 class permits, and Zones 21 and 22 dust atmospheres, with certified maximum surface temperatures of 65°C or 95°C. T4 models give outstanding light output using advanced, long life xenon bulbs, set in a high quality parabolic reflector, coupled with alkaline cell approval, giving up to 12 hours of light output. Alternatively T6 allows use in any Zone 1 or 2 atmospheres, with optimum light output in this temperature class, and a 5 hour duration. This high strength torch, available with a straight or right angle body, is extremely robust and reliable, with proven shock protection, even at sub zero temperatures, rubber armoured lens ring and end cap, scratch and chemical attack resistance lens – all sealed dust tight and protected from water immersion, with an IP67 enclosure. The compact, lightweight and ergonomic torch body gives enhanced grip and comfort for the user with easy single-handed switching, even with gloved hands, plus the replaceable high strength clip (on the right angle model only) allows for hands free use. Supplied as standard with wrist strap and clip ring. 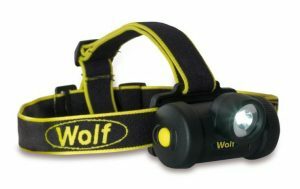 Its unique optics deliver a piercing white spot beam combined with a wide-angle flood of fringe light from a high power ‘fitted for life’ LED giving a peak of up to 130 lumens light output. Two D/LR20 primary alkaline cells provide a light duration of up to 17 hours. With a low battery power indicator allows a user to monitor the state of battery charge, a red flashing light is emitted through the side of the torch body while battery power and light output is high, but switching to continuous red when battery and light output is low, warning battery replacement is required. 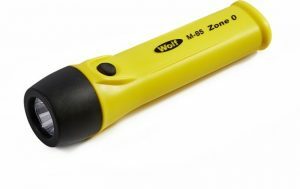 This high strength right-angle torch is extremely robust and reliable, with proven shock protection, even at sub zero temperatures, rubber armoured lens ring and end cap, scratch and chemical attack resistance glass lens with an IP67 enclosure. The compact, lightweight and ergonomic torch body gives enhanced grip and comfort for the user with easy single-handed switching, even with gloved hands, plus the replaceable high strength clip allows for hands free use. Supplied as standard with wrist strap and clip ring. Its unique optics deliver a piercing beam of outstanding light, combined with a lower level flood of fringe light, from a high power ‘fitted for life’ LED giving a peak of up to 192 lumens light output. Four AA/LR6 primary alkaline cells fitted in a cassette provide a light duration at full brightness of up to 6 hours and thereafter a low level light for many hours. 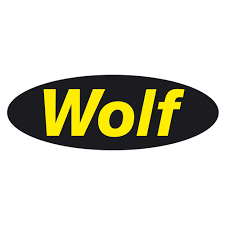 The Wolf ATEX LED Torch is very low maintenance with quick and easy parts replacement, a full spares service is offered for all internal and external fittings, and the LED is expected to last the product’s lifetime. The HT-400 is compact and lightweight weighing only 90 grams including batteries and constructed from robust, highly durable, high impact thermoplastic materials, which are chemical resistant and electrostatic non-hazardous, and fitted with a shatterproof polycarbonate lens. The tilt adjustment mechanism allows the user to angle the light and the bespoke optics deliver a broad spot beam suitable for close up hands free tasks, and is designed for single-handed switching and water/dust tight to a minimum of IP66. With a ‘fitted for life’ high power LED light source, the HT-400 has up to 75 lumens of light output, with an optimum light duration of approximately 8.5 hours from a set of three AAA alkaline cells. The use of primary cells makes it economical for personal lighting. The ATEX LED HT-400 Headtorch is supplied fitted with an adjustable removable fabric head band allowing it to be comfortably worn, at a low profile, directly on the head for extended periods and a set of 4 helmet clips to allow it to be securely attached to a hardhat. The HT-650 weighs 180 grams including batteries and is constructed from robust, highly durable, high impact thermoplastic materials, which are chemical resistant and electrostatic non-hazardous, and fitted with a shatterproof polycarbonate lens. The tilt adjustment mechanism allows the user to angle the light and the bespoke optics deliver a broad spot beam suitable for close up hands free tasks, and is designed for single-handed switching and water/dust tight to a minimum of IP66. With a ‘fitted for life’ high power LED light source, the HT-650 has a powerful light output of up to 130 lumens with an optimum light duration of approximately 17 hours from a set of three AA alkaline cells. The use of primary cells makes it economical for personal lighting. The ATEX LED HT-650 Zone 0 Headtorch is supplied fitted with an adjustable removable fabric head band allowing it to be comfortably worn directly on the head for extended periods and a set of 4 helmet clips to allow it to be securely attached to a hardhat. The HT-650 is also supplied with an easy clean inert silicone rubber strap, which grips to a hardhat. 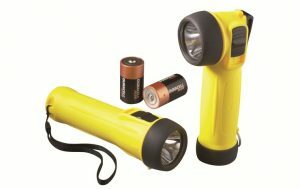 he CorDEX Intrinsically safe lighting range includes the lightweight and rugged Flashlights. Power, Longevity and Flexibility at your fingertips with the GENESIS, intrinsically safe lighting solutions from CorDEX. Every product in our flashlight range is manufactured from the highest quality aircraft aluminium. 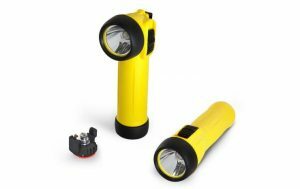 FL Series flashlights are impact resistant, shockproof and are so durable, you can even use them underwater. Not only are these probably the most rugged industrial flashlights on the market today, they are also Intrinsically Safe. Incorporating super bright, white light LEDs powered by off-the-shelf batteries, the CorDEX FL Series Flashlights Pack a big punch in a compact package. Compact and robust ATEX torches and lamps are a key piece of equipment in many engineers inventory. Exloc Instruments are pleased to offer a comprehensive range of lightweight models suitable for many different I.S. applications, all of which carry a lifetime guarantee for your peace of mind.